I'll let you in on a secret: I think Luke Davies is in love. OK. So it's not much of a secret. Still, while descriptions on the jacket refer to it in a variety of glowing terms (‘A sustained aria' &#151 Peter Porter; ‘the great Australian long poem' &#151 Judith Beveridge) what they basically elide is that ‘Totem Poem', and its 40 companion poems are pretty much all about love. And so we pass the microphone to Davies. the monkey of all events, the great gibbon of convergences. Such tones and motifs recur throughout the poem's length as Davies and his lover see out their days in the timeless daze and languor of love… and sweet lovin'. On this journey, they are accompanied by a variety of spirit guide-like creatures. But the facts of the mundane remain. Here is a city where ‘The air / fitted like a glove two sizes too small and too many / singers sang the banal'. There is a rusting car near Yass where the lovers sleep, shivering with sickness. in life just as the world was held in time. to begin to come terms with imperfection. Thus he and his lover move towards some sort of salvation, albeit an imperfect one. In this state, the world and its decay inhabit them, and they, intimately, sensually, inhabit it. In this state, each moment is impregnated with tenderness and wonder. And so we come to part two of the book, ’40 Love poems'. Rarely have I seen a book so stylistically divided. Whereas the 270 odd lines of the aptly titled ‘Totem Poem' are almost stream of conscience-style exuberance &#151 playful, sexual, shamanistic &#151 Davies's ’40 Love Poems' are an exercise in controlled quatrains, each poem composed of three stanzas with an ABCB rhyme pattern repeated throughout most. Unfortunately, this formulaic approach to form is somewhat reflected in content. 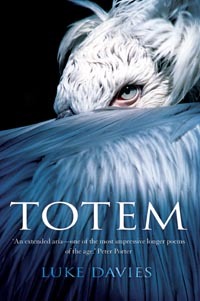 Davies does not truly develop from the ambitious ‘Totem Poem'. For the most part his love poems, some of which rhyme and flow better than others, are snapshots recounted in a language which, while tender, flounders upon certain images, such as when he compares the glow of his lover's cheeks to that of a lantern, or when he notes the lovers floating in a river with their ‘midday blisses' and the sun blessing their ‘watery kisses'. It is in ‘(Blade)', ‘(Shudder)', ‘(Bearing)' and ‘(Nine Hours)', Davies's knack for incisive metaphoric observation re-emerges. ‘(Nine Hours)', a definite highlight among its 39 brothers and sisters, is concise portraiture, as he conjures up the image of an empty Los Angeles (‘Everyone's off making films today') and combines this with a smart metaphor involving travel, love and flight-paths. How can this depth of feeling be gleaned through statements such as Davies's ‘Her nakedness is all'? I agree, when someone is in front of you, the horizon slips away. But beyond that there is the real &#151 and how, exactly, does love relate to this, beyond the metaphoric? Where are those elements that even love cannot reconcile? Where are the lovers' quarrels? Where is the emotional and linguistic complexity of learning how to say ‘I love you'? Somehow, most of these poems seem too easy, almost as though, having completed the psycho-sexual journey through death, time and love that was ‘Totem Poem', Davies feels he is able tell us, in poetic terms, what to think and feel. Poetry and poetic language do not in themselves offer any particular connection to the universal, even in rhyme. Indeed, the idea of poetry as higher-language, as privileged connection to Truth, is problematic, if not archaic (as is the idea of truth with a capital T). An inquisitive and detailed exploration of the sites of conflict located in the particular is what foregrounds language as an equivocal entity by which one can hope to inhabit and imbibe an equivocal world. has capacity to learn the fact of death. of it still expects another conversation. This entry was posted in BOOK REVIEWS and tagged James Stuart, Luke Davies. Bookmark the permalink. Submission to The Lifted Brow and Cordite’s 51.1: UMAMI Now Open!